I was asked recently by a good friend of mine, who is a beginner sewist, what kind of tools she needed to get started sewing. She already had a sewing machine, and had participated in a beginning sewing class to learn how to use it. Then, when she sat to do a project on her own, she realized she was short on the necessary tools for the job. What should she get? 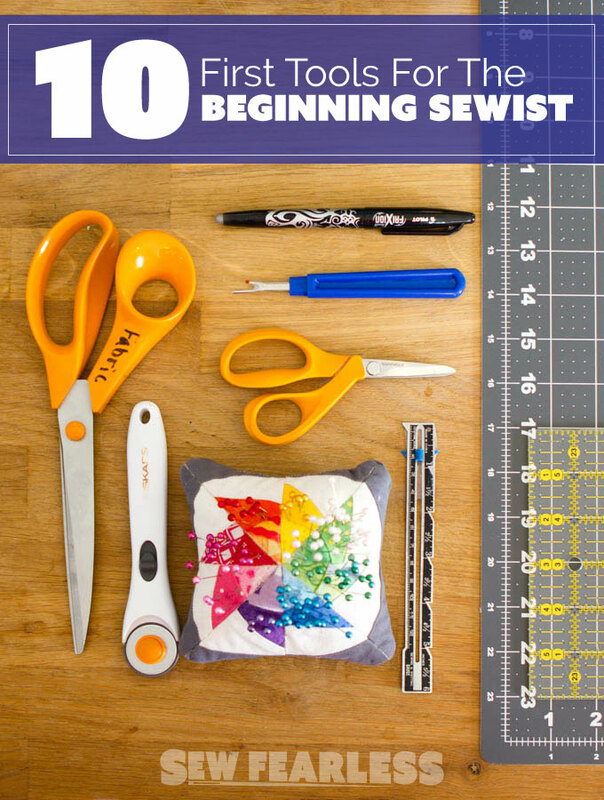 The First 10 Tools Every Beginning Sewist Needs. These are the workhorses of my sewing room. 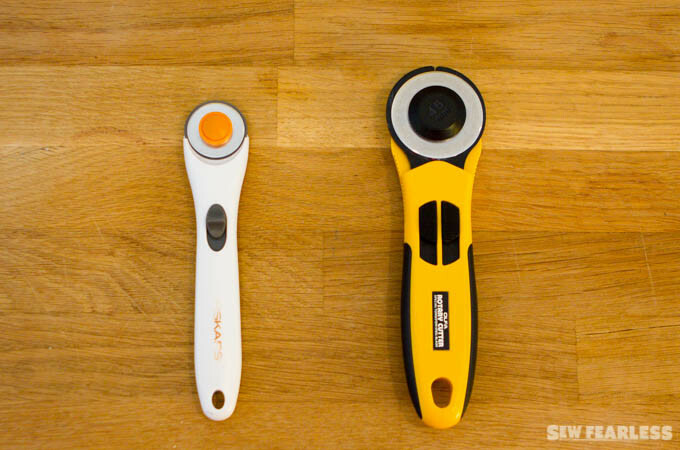 They aren’t the fanciest tools available, but they get the job done, and they do it well. First thing every sewist needs a dedicated pair of fabric scissors. 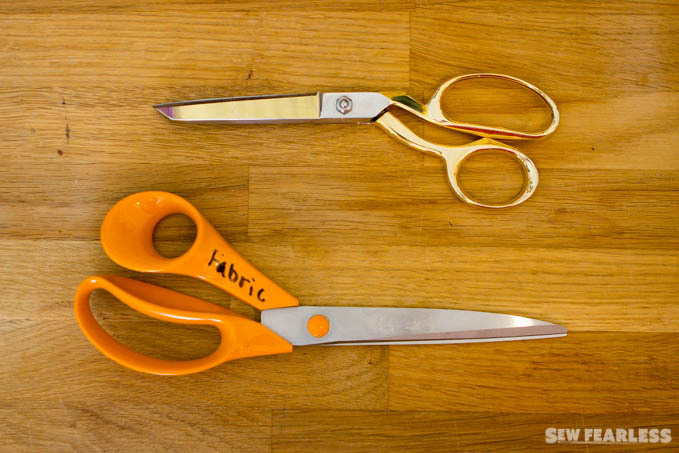 My go-to pair is the classic orange-handled Fiskars 8 inch scissors. They are sharp, strong, and comfortable. I also have the classic Gingher all-metal dressmaking shears, but I find that it isn’t as comfortable for me for daily use. Not only do I use rotary cutters to cut out quilting or bag projects, but they are also my go-to for knits and slippery fabrics. Because of this, I prefer my Fiskars 28mm over my Olfa 45mm for all but the thickest fabrics. The small blades zip around curves more precisely. FYI, you can and should replace the blades on these when they become dull. A rotary cutter is useless without a mat to cut on, and as cutting mats go, you want it to be the biggest you can afford/store/use. 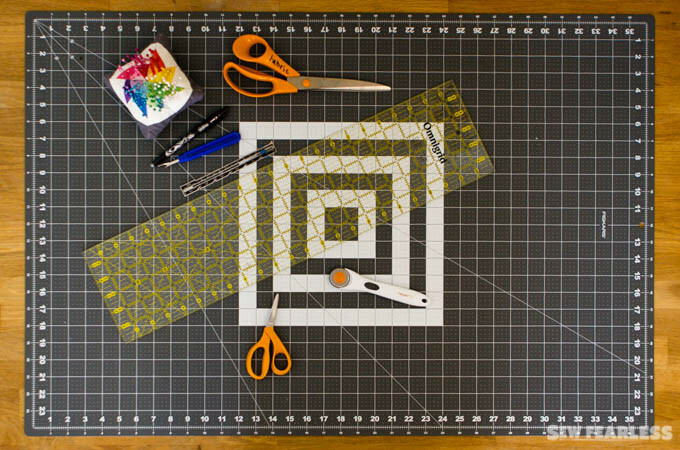 I love my 24 by 36 inch Fiskars mat . 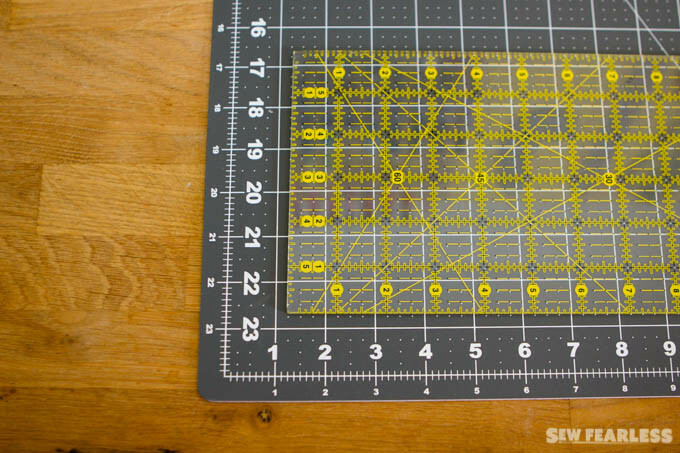 You will also want a ruler for precisely cutting rectangles of fabric. My 6 inch by 24 inch Omnigrid ruler is the size I reach for the most. You will also need a smaller measuring device for checking seam allowances, or measuring hems. I should buy the 6-inch measuring gauge in bulk, because I like to always have one in arms reach and I can never find mine. 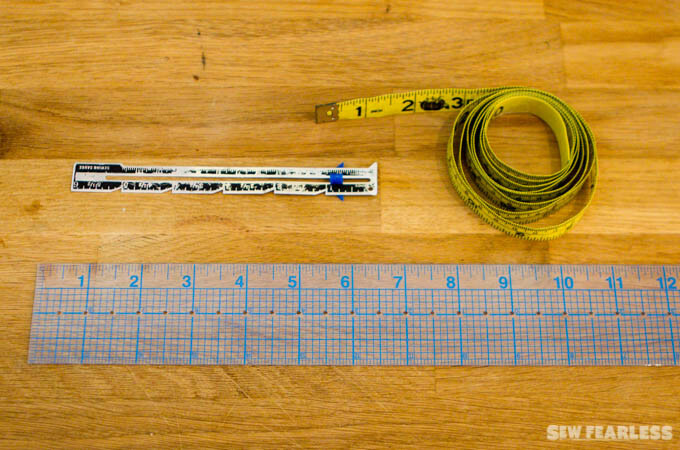 A measuring tape or other ruler would do nicely in a pinch. Pins are the friends of beginner and experienced sewist alike. There are lots of different kinds of pins, but I have found my yellow 1 3/4 inch “quilting pins” work well for most projects. However, I love my pearlized head quilting pins the best, if only for the reason that they are pretty and shiny. The pins will need someplace to live. I can’t say I am too picky about pincushions though. 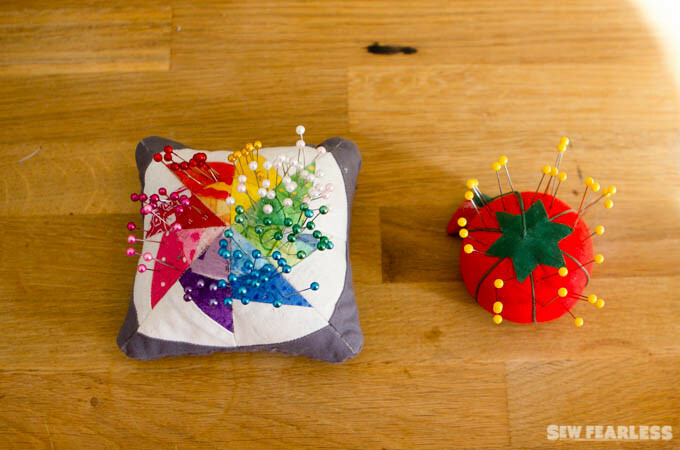 There is no need for you to be stuck with a tomato pincushion, when there are so many fun options available. Have fun picking one out that brings you joy! There are so many different options out there and I have tried so many – Tailors Chalk, Tailors Wax, and Mark B Gone pens and pencils. My favorite by far is FriXion pens. These are not technically a sewing tool, but you can find them at an office supply store. The cool thing about these pens is that ink becomes clear exposed to heat (like an iron). 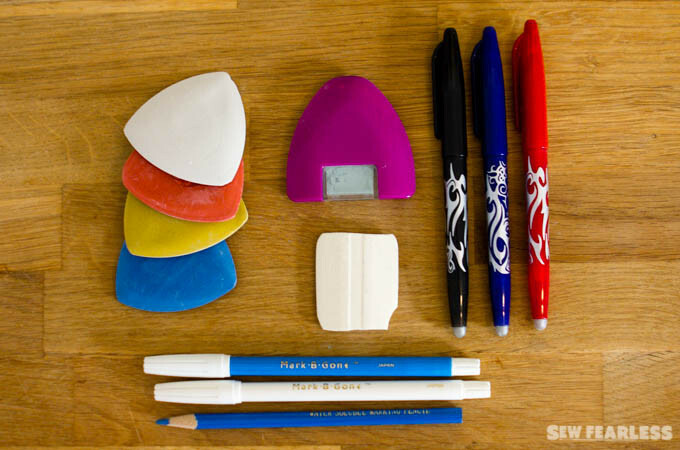 I use these more than any of my other marking tools, but you do need to check and see if it will work for your fabric. 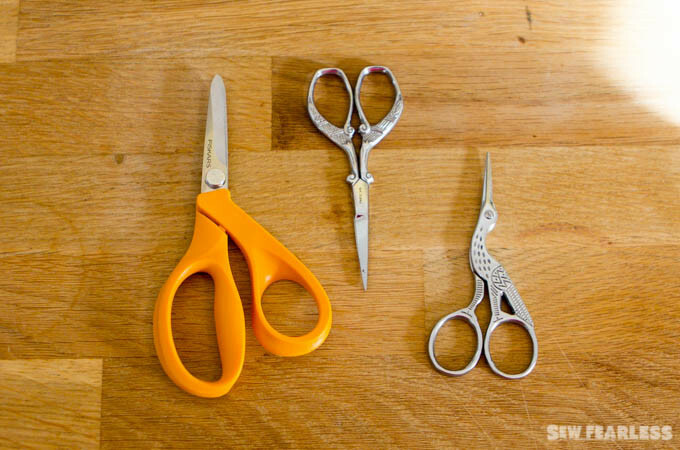 In addition to your standard sewing scissors, you might like to have a small pair of scissors for snipping off threads and clipping seam allowances while sewing. 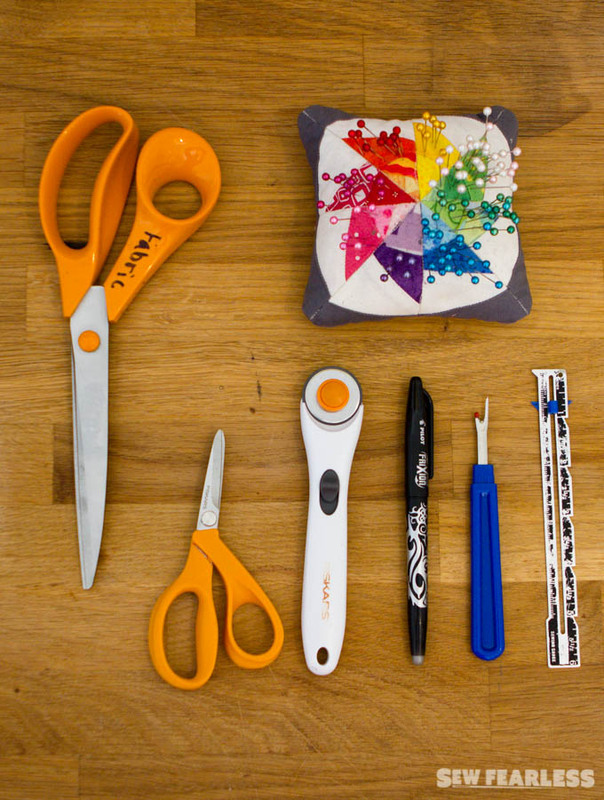 The stork embroidery scissors are a sweet classic, but I adore my Fiskars 5-inch “Razor Edge” fabric scissors. They are as equally qualified for cutting leather as they are for cutting thread, which is why they have been in such heavy use around my sewing room. As you sew, so shall you rip… Don’t fear sewing mistakes, and get yourself a seam ripper or two or five. It’s not glamorous to admit we mess up, but a nice sharp seam ripper will make the learning process that much less painful. These are my top 10 sewing tools for the beginning sewist. Do you think I left anything out? What are your must-haves? I legit just bought my first pair of “sewing scissors” this week. I’ve always cut with a rotary and never really needed good scissors. But holy cow do they cut things so much better! What have I been missing these last few years of serious sewing? oh, honey. you were definitely due for a pair!!! Aren’t sharp scissors deeply satisfying? !